Provenance / Collectors' marks: John Webster, 1810–1892, Aberdeen (Lugt 1555 stamp “IW” in black ink on verso). Emil Schroeter, died about 1912, Dresden (Lugt 2270 stamp in black ink on verso). Purchased before 1928, possibly as early as 1912, by George W. Davison. 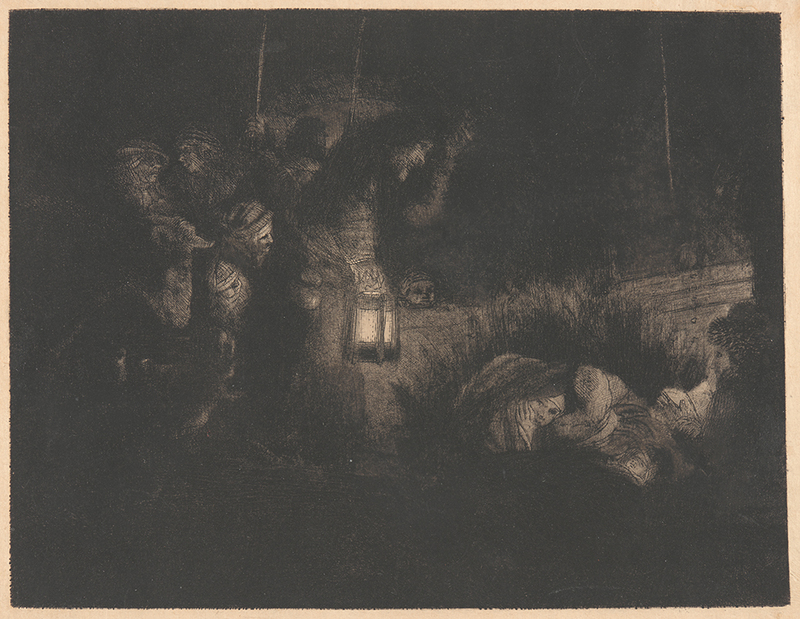 Bibliography: Bartsch 46; Hind 255; Münz 237; Robert Fucci, Rembrandt’s Changing Impressions (New York: The Miriam and Ira D. Wallach Art Gallery, Columbia University, 2015), cat. no. 16.4, reproduced p. 127, see also p. 123. The Adoration of the Shepherds: A Night Piece, . Etching, engraving, and drypoint on Japanese paper. Eighth of eight states. Plate: 149 x 193 mm (5.9 x 7.6 in.). Sheet: 172 x 212 mm (6.8 x 8.3 in.). DAC accession number 1937.D1.93. Gift of George W. Davison (B.A. Wesleyan 1892), 1937. Open Access Image from the Davison Art Center, Wesleyan University (photo: R. Lee). http://dac-collection.wesleyan.edu/obj11992 is a persistent link to this page with no user-session information.